I know the blog has discussed before if it’s appropriate for younger folks to have designer items in the office. Mine is similar… basically, do I have to stick to brands below what my boss has? It’s an ad agency. I’m in management, she’s VP. She makes double what I do. She carries a Kate Spade tote and lower-end Coach purse and acts ashamed of spending so much if anyone compliments her bags. Does that make it inappropriate or unwise for me to carry similar? Back to Reader A: Kate Spade and lower end Coach are in different ballparks than a Birkin. (In fact, I put them in tier 2 and 3 of our last discussion on how to upgrade your handbag collection.) When you’re starting to build your working wardrobe I think it’s a great idea to spend a bit of money on a bag that’s going to be durable and is exactly what you want. I think it’s a bad idea to purposely buy a cheap bag just so you don’t upstage your boss — you’ll need a new one in a few months, to say nothing of the ethical considerations of buying fast fashion. Don’t go into debt for a bag — and know your office (a diamond-encrusted Birkin is probably not appropriate for any office), but in general: buy what you want and don’t worry about it. If your boss specifically asks about it, you may want to brush it off with a comment like “thanks, I’d been saving for it for a while!” or “it was a killer sale!” — but even that is unnecessary. Readers, what are your thoughts on designer bags and younger workers — what do you think of as work-appropriate designer bags? Would you advise someone against dressing better than your boss? Pictured at top: Kate Spade bag on sale at Nordstrom (where there’s actually a ton of Kate Spade stuff on sale). There’s also a surprise sale going on via Kate Spade right now, fwiw. Social media images via Deposit Photos / NicoleClaudia. Similar to the red bag pictured: here, here, here and here. Her boss hasn’t boxed her in at all, because what handbag her boss carries has nothing, absolutely nothing, to do with what handbag the reader carries. Honestly, this is nonsensical. The only time I can see it being relevant is if the overall job is a place in which a designer bag would be inappropriate (you’re not going to carry your Birkin if you’re a public defender, or teaching children in the inner city, or working for the Peace Corps). But aside from that? It just doesn’t matter. Oh, Kat, I would LOVE a Birkin Bag, but I do NOT have the $ to afford one, and if Dad saw me with one, he would really get mad. It does NOT matter that Rosa has one, and that Ed may have gotten it for her when he was atoning for goeing into some Gentelman’s Club on the West Side Highway in NYC, where the women were grinding their tuchuses into his crotch. FOOEY! Rosa really made Ed pay for that one, and now I can NOT have one. It does not matter to much b/c Dad says I can have a Prada bag, which is ALMOST as good. I hope to be able to attract a man with a Prada bag, and that guy would have to have enough money so that he would NOT think I was spoiled and would therefore NOT want to marry me. I want it in Sparrow Blue, which is my favorite color. Does ANYONE in the HIVE have a PRADA bag, and if so in this color? This is crazy. All of my associates carry nicer bags than me (I’m a partner). I have kids + daycare/nanny expenses, and own a home. Most of them rent or if they own, have a condo. I definitely was more willing to carry a $1000 bag when I was younger. I don’t begrudge them that at all. Agreed. I think this is all ridiculous, TBH. It all depends so much on where you’re at in life and what your particular set of circumstances and priorities are. Some people just don’t wish to spend $600+ on a bag, and you shouldn’t spend your mental energy worrying about it. Some people who are in that same position get bags like this for graduation gifts, etc. Your boss might have a less expensive (but still very nice bag), but a million dollar house or retirement fund that you’ll never know about. By being so “sensitive”, I actually think you’re being really judgmental. Just buy whatever the heck you want and do good work. That’s what people actually care about at your office, especially your boss. I agree, it’s ridiculous. I was never in biglaw and don’t have a $1000 bag. But I have a few $300 bags. My boss carries bags from Kohl’s. She owns three vacation homes. Everyone chooses to spend money differently. +1 I’m not a bag person. I appreciate a nice bag, but I have no inclination to own one myself. It’s one thing if the intern is bringing in a Birkin IMO; it’s another if my subordinate /peer / boss has a designer bag while I enjoy carrying the cheapest one from the TJ Maxx clearance rack. My boss doesn’t carry Coach or Kate Spade. She carries outlet Coach and Kate Spade. Let’s just say that I am at least a notch–if not 2 0r 3 above that. I have no concern about impropreity, though. Around here, co-workers think Michael Kors is like reaching for the stars. I wear good quality jewelry, shoes and bags every day. I’m not going around bragging about them, but I’m not going to carry a cheap bag because my boss does! My boss doesn’t carry Coach or Kate Spade. She carries outlet Coach and Kate Spade. Let’s just say that I am at least a notch–if not 2 0r 3 above that. I have no concern about impropreity, though. Around here, co-workers think Michael Kors is like reaching for the stars. They don’t recognize anything I carry. Isn’t that just fine if they don’t recognize what you carry? 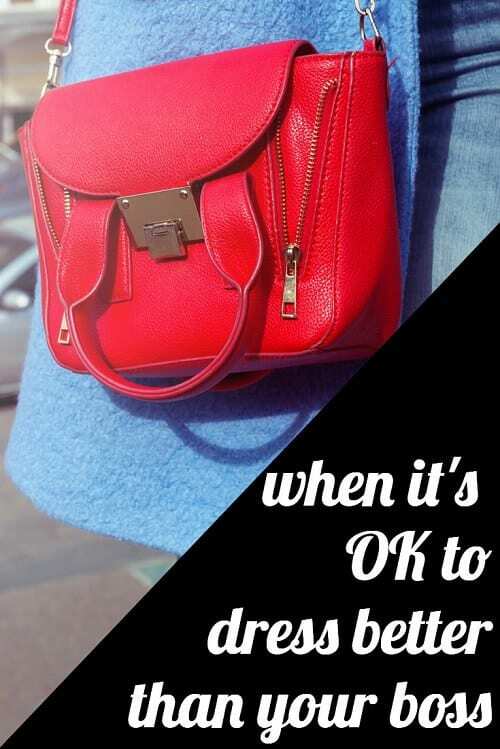 You’re wearing / carrying the bags you prefer because YOU prefer them … right? Reader A, I would not assume everyone is as aware of the cost of different types of bags as you. Personally, I probably wouldn’t notice if someone carried something more expensive than me. It’s not something I pay that much attention to. Unless it was an $8k bag like a Birkin. Compare it to conversations about what people drive in the parking garage. My boss drives a BMW 3 series. My coworker drives a brand new Tahoe. No one ever comments on the cost of either of those cars. I have, however, heard people remark on the one guy who drives an Audi R8. A brand new Tahoe is still a pretty expensive car, but it’s not flashy and aggressive like an R8. +1 This isn’t really that hard. Wear what you want as long as it’s professional. Super-flashy, brand heavy things aren’t usually professional. If it is professional for your industry (like Swiss watches in finance), you’ll find out pretty quickly. If you genuinely like your pieces and are not obnoxiously flaunting them, I don’t see any issue with that. Many people don’t recognize the brand and price point if there is no visible branding. Women in my office don’t buy expensive pieces (they shop at H&M and Zara which is cheap in Europe). Some more junior people would have the LV or Gucci scarf but I know that the most senior women carry brands from the high street (Zara, & other stories). My usual outfits are anywhere from 3x to 10x what their outfits cost but since I have no logo, no one ever knows. The only time someone realized I was wearing an expensive dress was when a CEO client commented she had the same dress as me. I got a couple snarky remarks (from a male supervisor who wears cheap suits) then we moved on. I have a tiny wardrobe but the individual items are slightly on the high end side and I don’t get any negativity because of it. Agreed My guilty pleasure is expensive scarves which cost more than most of my bags, but I remove the labels because nobody needs to know butme. Reader A – carry the bag that you like and do not give a second thought to this. This idea is ridiculous to me. The partner that I work immediately under hates clothes and dressing up, shops at Walmart and gets her hair done there. The fanciest thing she wears is a “dressy” polyester flowered top and black pants. Am I supposed to match that, for real? Hell to the no from this designer bag lover. I don’t understand all the hate for polyester. I’m allergic to wool and silk is hard to keep clean and expensive. There is “nice” polyester and cheap polyester too. I think it comes from my early teenage years when I first wore polyester, realized it was scratchy and stinky and now I have an irrational disdain for anything that is not natural fiber. The only time I consider synthetics is for performance fabrics to workout. There is nice polyester…and there is the $20 mall-store polyester. My superior wears the latter. I have tons of polyester blouses in my wardrobe and am not biased against the fabric as a whole. Oh lord, here we go ….. The snobbery is stunning, but not surprising. Not quite the same situation, but I have a HHI income that is much higher than my co-workers and even my boss, thanks to a high-earning husband (my co-workers and boss are all single or have wives who don’t work). Our combined earnings let us travel and drive nice cars and indulge in small luxuries that my boss and co-workers don’t. I’m not going to deny myself something I want and can easily afford just because people I work with can’t or don’t want to buy the same things. Of course an $8000 handbag is a very different story but I wouldn’t worry about carrying slightly fancier bags, especially when your boss can likely afford them and just chooses not to buy them (maybe she’s just not really into handbags? I’m not). You sound like my former supervisor. Same age as me, didn’t make that much more than me, but got dropped off at work every day in a Mercedes thanks to her husband. I’m probably in the minority, but I don’t know what a Birkin bag looks like. I don’t even know how much most designer bags cost. You’d know a Birkin bag if you saw one, they’re always in TV shows and movies. And they cost a shocking amount. Like…$10-20k. I only know them from reading here, and I just googled to see what they look like. I must really not be style conscious, because they look like every other bag to me. In general, I don’t really notice different kinds of bags, except things like big vs small, and this is no exception. And you read this blog? A fashion blog, that discusses different kinds of bags…..literally every day? 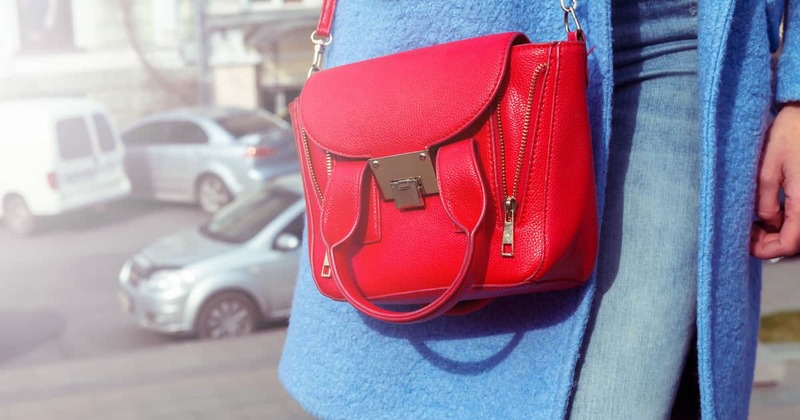 I think that to the extent it matters – whether actually or because it will make you self conscious- you can find plenty of nice handbags that are not ‘labels.’ So I don’t see this as a choice between cheap bag and expensive one, more as an issue over label or name brand handbag vs not. Personally I don’t think there is anything wrong with carrying a similar bag to boss, regardless of how boss may act about it. Some people are just awkward. Yeah the idea that a non-designer bag is cheap and poorly made is total snobbery, I like quality, not bling and prefer to support artisans where possible. My bags aren’t anything you’ve heard of, cost a fraction of designer and are incredibly well made. But… I want to hear of such bags! Where do you find your well-made bags? I don’t care about labels. Usually at independent little boutiques that really curate their offerings and have more unique goods that you can inspect for quality. There used to be a French import shop in Shirlington Plaza outside of DC where i bought a yellow leather wallet for what I thought was an outrageous price at the time, but 12 years later I still use it daily and it’s gotten even better. I have a beautiful navy blue structured bag I got somewhere outside of Philly that’s Italian leather and amazing. I also like bags made by British equestrian brands now that I live in the UK. Awesome. I will look out for places like these. The best bag I ever bought was from some artist in Maine. The leather has aged beautifully, but but I forgot the name of the shop and couldn’t find it when I looked again. That was a casual sling, but I would like to find bags of similar quality to wear to work. I am tired of spending real money on pretty bags whose handles start to crack and fray within a year or two (most of the brands discussed on this thread are not above this). One of the people I supervise carries a much nicer bag than I do. And I DO NOT CARE, nor begrudge her for having a nice handbag. If anything, it reminds me that *I* should step up my game. It’s just not a huge priority of mine. Just last month, I spent my “handbag upgrade” budget on new workout gear from Athleta, which many would consider completely frivolous but makes me happy. Money spent on new workout gear is money well spent, not frivolous. It’s all individual, isn’t it? Some people are motivated by having the latest and cutest Lululemon or Athlete or Alo or whatever; others aren’t. Vive la difference! How about we just don’t judge any types of spending? What’s frivolous to you might not be to somebody else, and money for workout gear might not be a priority for others. Basically, there’s no ethical consumption under capitalism anyway, so stop trying to make yourself feel better about your own spending by putting other peoples’ habits down. It’s all the fr3aking same in the end. While not true for you, the reminder of needing to step their game up could cause a lesser woman to act out, so to speak. People be petty. My legal secretary has a LV bag. I DO NOT CARE. I know about it b/c I see it all the time in her office, but I don’t care. Me? I’ve got two kids in private school. $$. My love of all things Prada has taken a backseat and I’m cool with that. I’d also point out that she could be really into bags but could have kids of a certain age that make carrying super nice bags a disaster. I have a toddler and routinely have her snacks, water bottle, wipes, diaper creams, etc. in my bag. Inevitably something makes a mess fairly regularly. Even if you’re into dropping $1000+ on bags regularly, you’re probably not into ruining them. She could have a whole shelf of them at home that rarely see the light of day due to her life stage. The only time I think it matters is where you work. I worked at legal aid and we were very conscious on our name brand stuff . We didn’t flash our purses or name brand clothing but we didn’t deny ourselves either. Now that I am back at private , who cares? No one . I have a nice bag but under $100, I have a cheap car but my 2 kids are in private school. Another lawyer making the same as me as a LV bag and a BMW, but she is double income no kids. All about priorities. I will never have an expensive bag in the forseeable because the kids put all their crap in my bags and ruin them. I do spend $$$ on shoes though. I need comfortable nice heels that will last and cheap shoes do not.